The countdown to christmas really begins as we enter the month of December. Of course that means finding small and simple gifts to put in your child’s stocking. So probably like you, I have been browsing the world wide web to find the perfect stocking filler ideas to put in my children’s stockings. 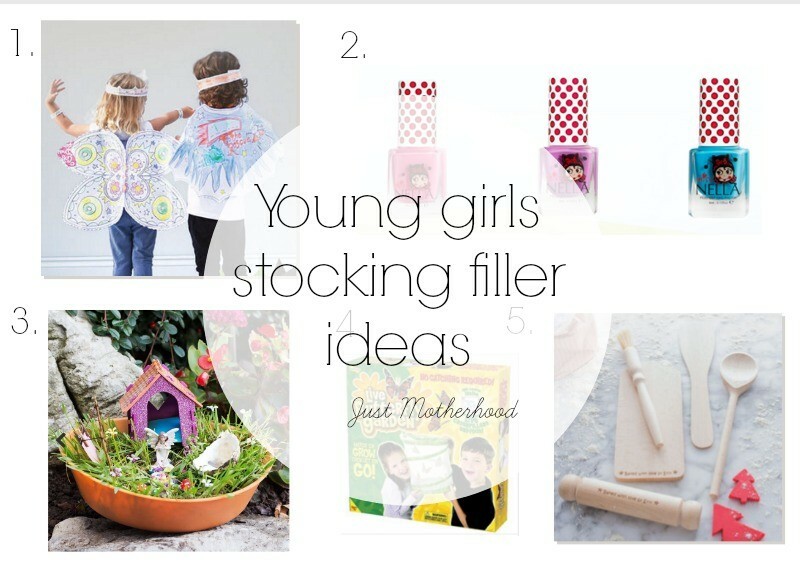 This year I want to buy Sophia stocking filler presents that she will be excited to use and to create. I especially love the gifts I have picked out here because all of them allow for her to use her imagination, to play, explore and/or create. So, that makes me happy. I love this idea, paper fancy dress outfits that attach to clothes with two velcro dots. I have never seen anything like this before and it makes it even more appealing. I think Sophia would really enjoy this. She can get creative, use glitter or even paint. Crafting is one of her favourite things to do. Sophia is 5 and absolutely loves painting her nails. Many times she has got it on the floor or even her whole hand. She has become a lot better at it so I was so pleased to have found these for her. They are not only non-toxic they peel off too which really is great. Miss Nella nail varnish is recommended for girls aged 3+. I was so pleased when I found this as Sophia loves fairies and something that also reminds me very much of my childhood. The kit comes with everything your little ones need to create their very own magical fairy garden. What a lovely way to encourage imagination and have something they have created themselves. The life cycle of the butterfly is a truly wonderful thing. It is something I have wanted to get for my two for a long time. I thought it could be a perfect stocking filler. There’s no better way to get up close and personal with these astonishingly beautiful and fascinating insects, how lovely to be able to do it from your own home. I think Sophia would love this. There is nothing my daughter loves more than baking. I think she would bake cupcakes every evening if she could. So I think she would absolutely love this baking kit. I love that it is personalised making it even more special. More so now that she can read her name. I love the idea of personalised kids baking and this is such a perfect gift for the little one that loves baking. Definitely something I would buy and gift it to someone. I love mini nail varnish and glad you have chosen the non-toxic ones, nail varnish can be quite strong. Great list. The butterfly garden is a great idea. I have never seen this before may have to look at getting it for my son. Blogging Mummy recently posted…7 Signs that your Electric Blanket may need replacing.